The garden has made a remarkable transformation in the last month, so much has started to reappear from plants to bees and butterflies. The birds seems to be singing constantly in daylight hours and we are already appreciating the longer evenings. 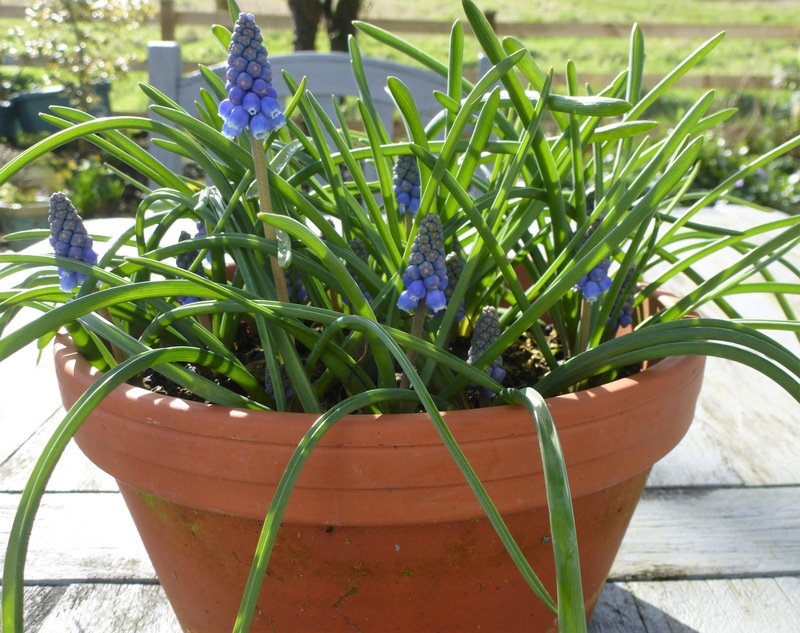 The first tulips have appeared in the garden with the promise of many more to follow, these grape hyacinths have been a uplifting sight from my kitchen window. Some flowers like the crocus have appeared and disappeared in a short space of time. These daffodils were a new addition to the garden.Having failed to find any Thalia daffodils last Autumn I was initially attracted to the name of these Sailboat daffodils- the swept back petals look like sails catching the breeze. At one point this month they had to contend with gale force winds. The casualties of this were taken inside to admire and filled the rooms with a beautiful scent. Do you have a favourite daffodil? 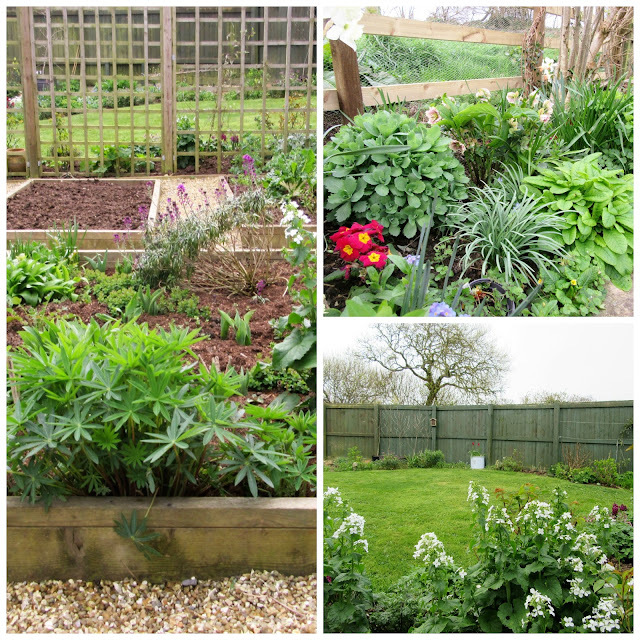 March has also been a busy time in the garden. We ordered 750 litres of composted cow manure from a local farm. It arrived when my daughter was away in Tenerife and with my husband still recovering from his operation the job of putting it on the beds was left to me!. The beds did look good when I had finished and then when Monty Don, on Gardeners World recommended this job, it felt good that I had already achieved it! 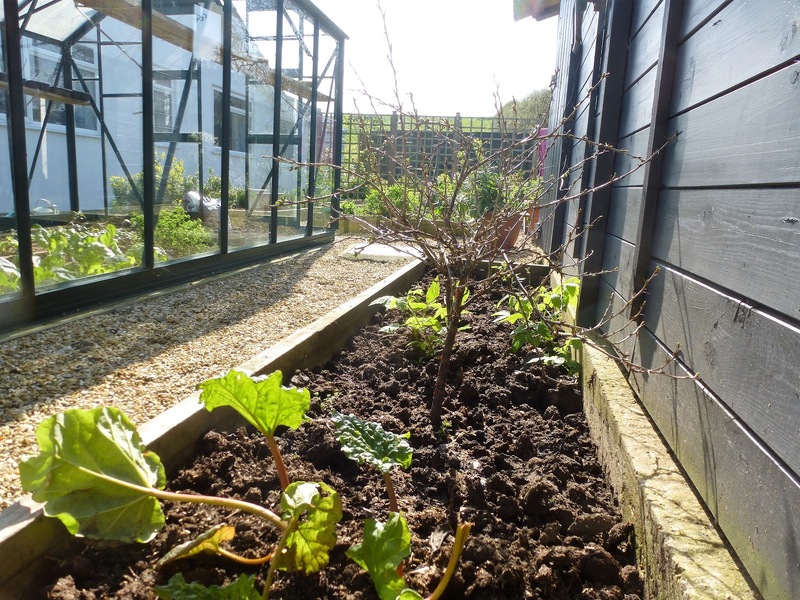 direct action I decided to remove the rhubarb and gooseberry to a different part of the garden and have gained so much more space for flowers! This is probably just as well with the number of seeds I have just started to propagate! Same views as last month just much greener! The garden is erupting in so many different shades. Plants or seeds from friends are always treasured. The white honesty flowers are from seeds that fellow blogger CT sent me. The start of Spring is such a wonderful time these daffodils brightened my day and made me smile , I hope they brighten yours too! Thank you for the supportive comments about dear Twinkle they gave us such comfort. those subtle red and pruple flowers? Wallflowers? Beautiful colours. What a spectular garden you will have, Sarah. The Dorset you show us is so beautiful. I just discovered ancestors from Dorset. It is great to see the area through your blog. They came from Wimborne Minster, Buckland Newton and Sturminster Newton. 1700s and 1800s. That would be wonderful, Sarah. Good morning, Sarah! As I see your developing garden patches, I am telling myself that when our time finally comes here, we are going to REJOICE! We are typically several months behind many states in the union, being up north in the midwest. But for the last 2-3 years, our springs have been much earlier. I have been on my "spring break" and all week, it's been cold, with the exception of Tuesday, which was brilliantly warm and sunny. But, we are back to our old tricks of cold, gray skies. Thank you for this open window into the future. Our spring will come. It looks as though you are a month ahead of us in your garden. I especially love my miniature daffodils. Your sailboat ones are especially apt for your garden! Your garden is pure delight! 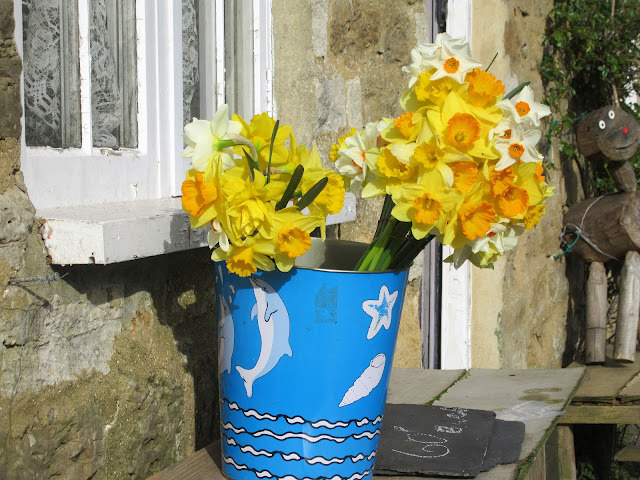 I love those daffodils in what looks like a dustbin! 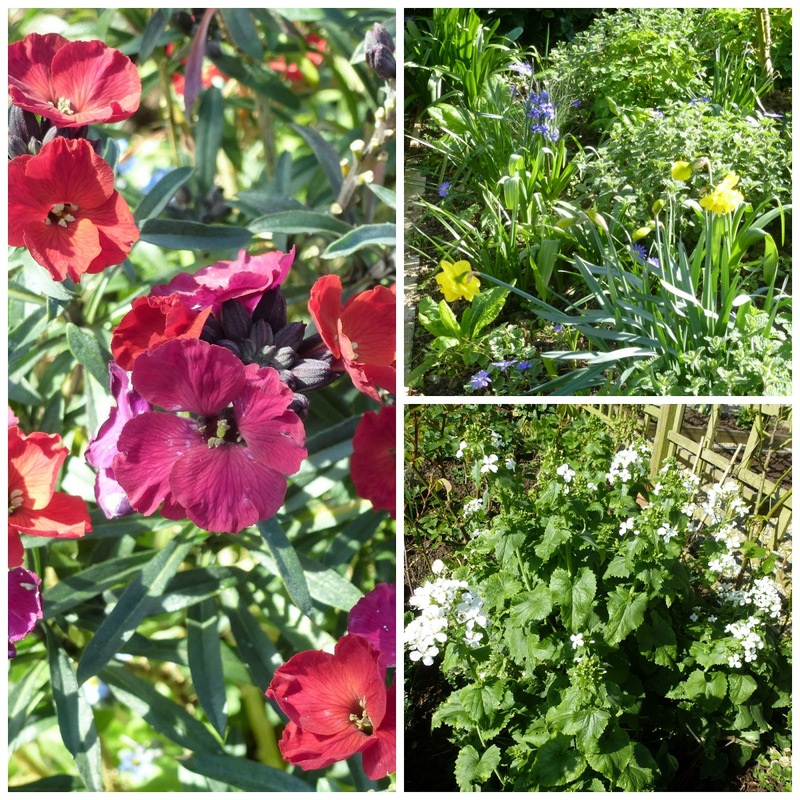 Your garden is really coming to life, Sarah! Such a treat to see. How doest it work? Do we all post on the same day? Monty was talking about sowing tomatoes last week and I felt so chuffed that not only had I done it, but they'd already germinated! Well done with the manure. I forgot to order some despite best intentions. Next year. You must be so happy with your gorgeous garden and rewarded for all your hard work with the pretty spring flowers. The Sailboat daffodils are beautiful. Well done for moving all the compost and a big job on your own. Spring is such a wonderful time of the year when the days are getting longer and warmer and the birds and bees make their presence known. Your garden is looking lovely, and well done for getting all that cow manure into the beds by yourself..no doubt it is the best exercise anyone could do! I love all daffodils...when I brought my second baby home from hospital all the daffodils in the garden had come out while I was having the baby...I felt as if they were all smiling at us as we arrived! 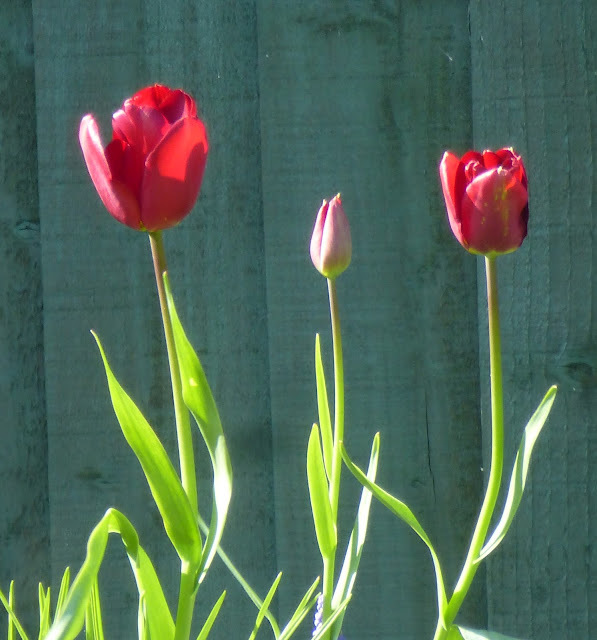 I love the first picture, with the garden fence as a backdrop for the tulips: what a fantastic combination of colours! I love teal and red together: they just zing. 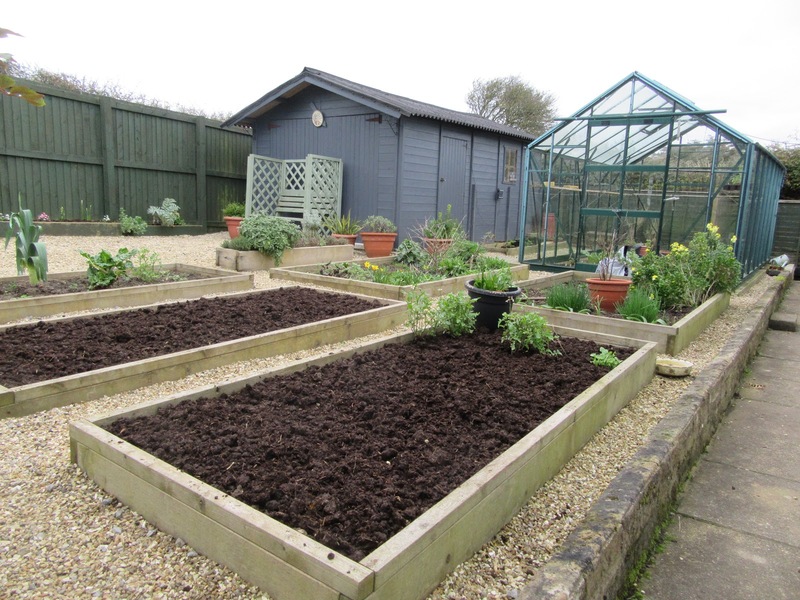 Dear Sarah, your raised beds are looking very good and you can be proud on yourself. Since yesterday I have a new raised bed, but 90 cm high, good for my bad back! I also love dafodiles, but the garden does not like them, they are always gone, the most of them. In this year I have baught some flowering dafodiles and put them in the garden, that looks beautiful. 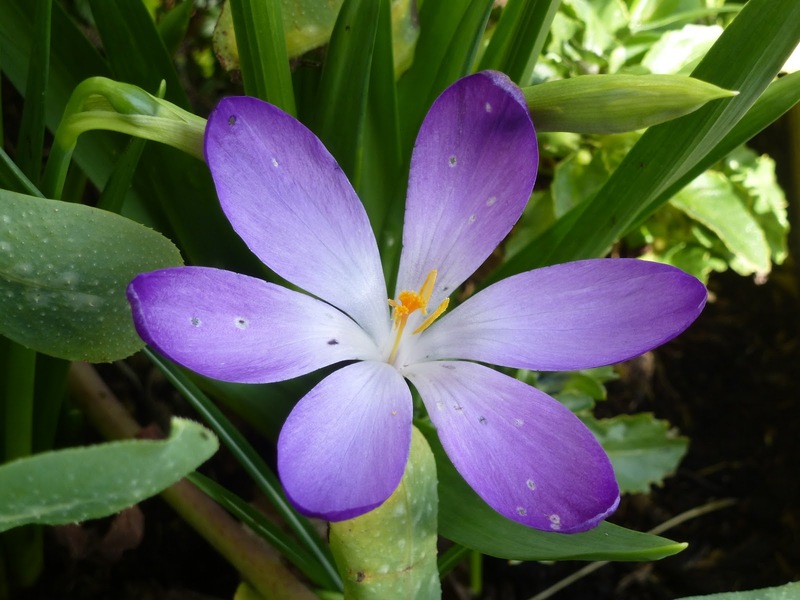 I also love Thalia and Jenny with its reflexed petals. Sailboat is a beauty. Deer and slugs have made an early start on my garden and I am feeling a bit disheartened. Lovely to catch up with your garden, Sarah - all is looking very calm and green but I bet there'll be a big difference in the next few weeks. 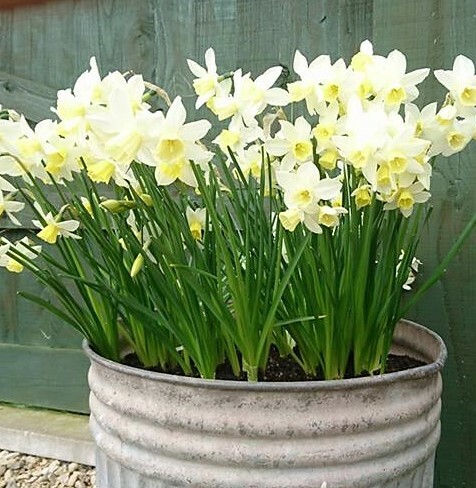 I had some lovely white and pale cream daffs but as I fill the community garden with them, I tend to buy the unnamed varieties from the supermarket as they're cheap. Thalia has been mentioned a lot this spring and is one that I'll look out for in the autumn. 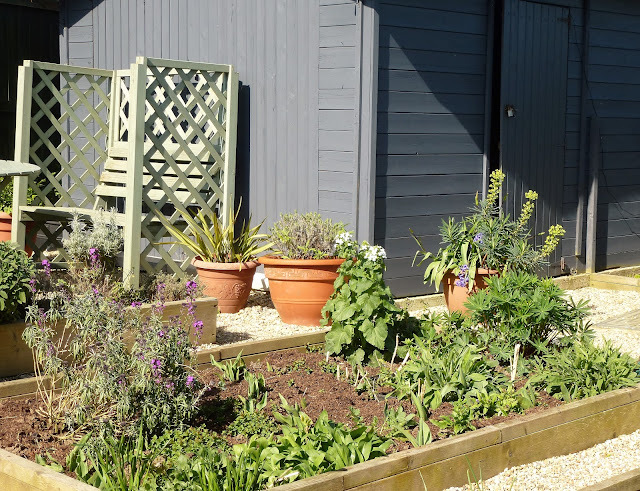 Mmm, I have veg patch envy, yours looks beautiful, as does the rest of your garden. Interesting to see how much further on everything is in the south west compared to north west.